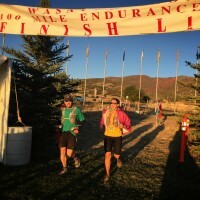 The Wasatch Front 100 Mile Endurance Run was slated to be my “A Race” all year, but the trail running season was long. 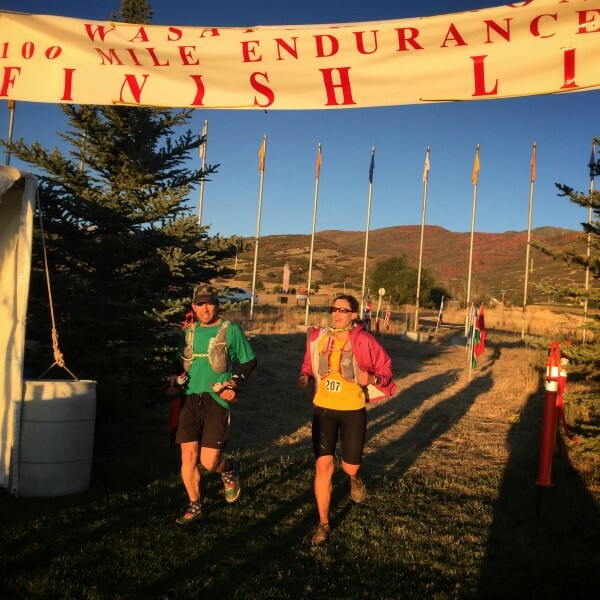 There were injuries, exhaustion, and the toll of co-directing the Castle Peak 100k. Nonetheless, I was able to put in the training and thought things might come together if I was lucky. And I wanted it. I wanted a new 100-mile Personal Record (PR) and I wanted to push myself to a new place of physical challenge. Coach Peter laid out the strategy: break the race into three 30-mile chunks, then the last 10 miles. First 30 miles: look around and enjoy the race. Middle 30 miles: focus; get through the heat of the day and know that things will get better after that. Miles 60 – 90: start testing yourself; push a bit and see how it feels; reel in some other runners. Last 10 miles: leave it all on the trail. The First 30 Miles: Have fun. Last week someone asked me if I was nervous. “I’m not. At least not consciously,” I replied. In terms of my training, I knew that was a done deal. You can neither gain nor lose fitness in the last weeks leading to a race; you can only fail to rest or get injured. alea iacta est. Truth be told, I did have one lingering anxiety surrounding the race. I was very worried about the logistics of the first 10-20 miles. It is a long climb in a congo line up single track. 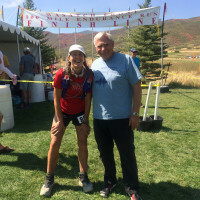 My best friend (and 6-time Wasatch winner) Betsy warned me that it can be dusty, “don’t get too far back in the line.” Yet, I didn’t want to get pushed into a pace that I would later regret. I was also worried about the aid stations. The first official aid station is at mile 13.8, but Betsy told me there are always volunteers at a natural spring serving water at the top of the big climb, about mile 9. Uncertainty is the devil. Then race morning started beautifully. I woke up at 2:23am, seven minutes before the alarm. I made coffee (my first cup in about a week), took a Vespa, and warmed my preferred pre-race food, tortilla de patata, even though it was nearly a week old. Javier (hubby / crew extraordinaire) drove me to the bus stop in downtown Salt Lake City. I had originally planned to walk, but decided that was too risky, so Javier kindly drove me to the bus at 3:30am. I arrived at the start feeling great and positioned myself near the front of the crowd of 313 starters. I was pleasantly surprised to find the course less dusty and less steep than expected. The congo line was tolerable. If I could see a gap ahead, then I would pass a few runners until I was in front. Coach Peter had given me some final pre-race instructions, and I kept these in mind the whole time. Essentially, he instructed me to mitigate the dust (he included some very specific strategies). Peter had a front-row seat to my asthma attack four weeks ago when he joined me for part of a 55-mile run on our Castle Peak 100k course. My exercise-induced asthma is heightened by both dust and smoke. That’s the beauty of a coach. As this article in the New Yorker explains, coaches “observe, they judge, and they guide.” Good trail running coaches do so much more than email a training plan ~ they provide a third-party perspective on your strengths and weaknesses. I proceeded up the 4000-foot climb and I just felt happy the whole time. It’s all working out! The trail is beautiful! The sun rising over Salt Lake City is lovely! And, then, just before mile 9, I encountered a couple of kindly volunteers serving up fresh spring water! I remembered to look around. And I had fun! Middle 30 miles: Be tough. Temperature extremes are a hallmark for the Wasatch 100: burning high-altitude sun on the exposed course during the day, followed by freezing temps overnight. Race morning was unusually warm, as I saw 68 degrees on my iPhone at 4:45am. What I did not expect was the extremely dry heat to start sooner, but it did. I left an aid station just before mile 30 at 11:39am with 1 liter (34 ounces) of Tailwind. My flasks were dry 75 minutes later, with over 2 miles to go to the next aid station. Be tough. And a little smarter next time. 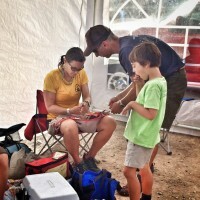 I took more care at the next aid station, though ice was in short supply at these smaller outposts, making heat management even more challenging. 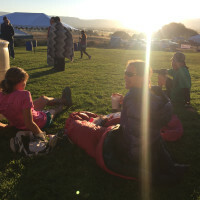 I would be seeing my crew (Javier, the kids, and my pacer Kelly) for the first time at Big Mountain Aid (mile 39). Time to put the head down and focus. No chasing squirrels. Free speed. I put one ear bud in and listened to my daughter’s favorite pop tune (Fight Song). On repeat. Finally, the last mile to Big Mountain Aid was descending switchbacks losing 800′ of elevation. In less than 10 minutes I was eating a popsicle and being packed with ice by my amazing crew. I was oddly running alone for several miles out of Big Mountain Aid Station. It was hot and my calculations told me that I was likely an hour behind my hopeful pace getting into Lamb’s (Mile 52). This was a little disheartening, but I stuck to the plan: Be tough. Things will get better once I get through the heat of the day. I arrived at Lamb’s at about 5:50pm, almost an hour behind my projection. At this point I realized the heat must be affecting everyone, and that I needed to put the lost hour behind me and continue according to plan. Seeing Javier and the kids again was a big boost, but picking up my pacer Kelly was even more motivating. I met Kelly Barber running. Then I met him running again. After meeting him a few times, I realized that he is a very giving and spectacular member of our ultra running community. I asked him to pace me late in the game, after my original pacer had to change plans. 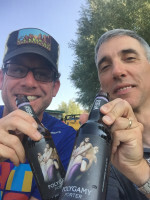 Kelly successfully completed the Mad Dog 120 just four weeks ago (learn about his food obsession in his race report here). 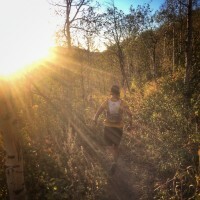 Two weeks ago he spent the weekend helping us at the inaugural Castle Peak 100k. We have both been busy this summer, and it had been difficult to have a full conversation about my plans for Wasatch. Kelly did a ton of course research on his own and we shared a few disjointed phone conversations. On Thursday before the race we finally had enough time to talk about my plan and my needs as a runner. 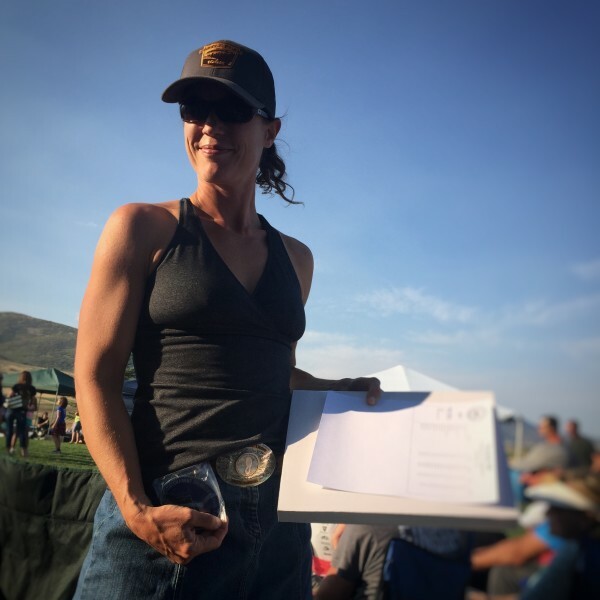 After a 10-minutes dinner break and refresh with the family, leaving Lamb’s (Mile 52) with Kelly was a game-changer. I struggled to keep up with his super-fast hike on the gradual paved climb. We settled into a pattern where he would hike about 20 feet ahead of me on the uphills. This distance gap motivated me and kept the dust down on the trail. I had grabbed a tube of T-Relief to rub on my quads as we hiked up hill. Peter suggested this to my crew via text message, though I had already been thinking the same. After about an hour of hiking, Kelly & I decided that my breathing was holding me back, and it was time to take a puff on the albuterol inhaler. I also took 200 mg of Ibuprofen, my first NSAID since my DNF at Bryce. I wanted my legs to be ready for the downhill. And they were! 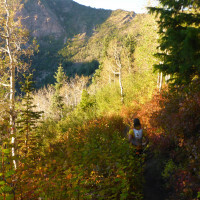 I cruised the beautiful 2-mile singletrack downhill at about a 10-minute pace. Kelly ran behind me on the downhills to keep the dust down and to let me set a pace that worked for my fried legs. That’s when I knew what had to happen. I needed to use the next huge, gradual climb to maintain / regain my downhill legs. 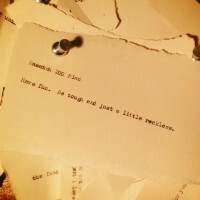 Miles 60 – 90: Just a little reckless. Going into my third chuck of 30 miles, I slowly recognized a flip-flop from earlier in the day. During the daytime, my breathing was strong, but my legs were heavy. Now, I had the legs to hike uphill, but I just couldn’t get enough air. A good pacer, like a good coach, provides third-party insights that you may miss yourself. “Is your breathing always this shallow?” Kelly asked. It had been less than 3 hours since my last albuterol, but he was right about my breathing. We stopped for the inhaler and I made a plan to keep on it every 3 hours. A bit later, Kelly asked me if we missed celebrating the mile 60 transition to “get reckless.” We let out a “whoop” and then I was ready. 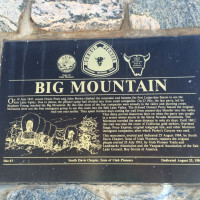 I had heard of this place called the “pain cave.” Fellow Donner Party Mountain Runner board member Chaz Sheya talks about it. Damn, he’s tough. 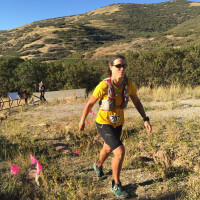 Betsy has asked me, “Do you want this to be the hardest thing you’ve ever done?” Before the Wasatch 100, childbirth (two natural deliveries) was the biggest physical challenge I had experienced. I had never voluntarily entered the pain cave (childbirth being quite involuntary). My very sensible central governor didn’t seem to allow it. But I was getting an idea of how to do it. For anything downhill to flat, I had to find a pace that my breathing would allow, and then push through whatever pain happened with my legs. There was space to enter the pain cave, and I wanted in. This image would help me each time we encountered runnable terrain. Each time we crested a climb, I would take some seconds to gather my courage, then announce the opening of the cave door with an audible creaking sound (Kelly said it reminded him of the B-52’s – like this). I wanted this to be the hardest thing I ever did. I wanted a “Pain PR.” Each runnable section I asked myself, “Am I there yet? Is this more difficult than childbirth?” I used music when I needed to. I tested myself and we passed other runners. 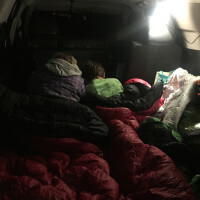 The night felt pleasantly cold and we blew through aid stations to prevent getting chilled. The last 3 miles into the Brighton Aid Station (mile 75) are downhill pavement. I ran those miles at a 9-minute pace, buoyed by my final opportunity to see Javier on course. Javier greeted us outside and I spent less than a minute at this indoor aid station. He told me the three lead ladies were just barely ahead. I told him that I didn’t care about that, but that was a bald-faced lie. I did care. I just didn’t know what I could do about it. Next up was one big climb to the high-point of the course, almost 10,500 feet. I had thankfully been able to recon this section, to know that the descent was steep, rocky, dusty, and barely runnable on fresh legs. I told Kelly that we didn’t need to worry about pace here. It was gonna take a while, but we just had to plow through it safely. My breathing was labored, but I knew everything would improve once we dropped in altitude. And it did! We finally arrived at the part of the race that simultaneously scared me and exhilarated me. What would happen? I couldn’t wait to find out myself. We had stopped briefly for some on-trail maintenance (I don’t remember what… maybe a gear change or inhaler break). It was just a minute, but in that short time, my legs became cold and rigid and the next attempt at running was brutal. Disappointment and doubt clouded my brain. Forcing the legs to work was crucial to a solid finish. I knew that we had passed mile 90, but Kelly’s watch was reading a little different, and he hadn’t caught on yet. It was time to “leave it all on the trail.” Only I wasn’t ready. This part of the race is a blur in my head. At some point I noticed that Kelly had his phone out. “Are you texting Javier?” I asked. No, he was cuing up the song we had planned to kick off the last 10 miles. Honestly, I can’t even remember what song that was now! But it worked, my legs warmed up, and we followed it up with more heavy metal in the form of AC/DC’s Back in Black. I finally allowed myself to start calculating finish times. My original estimate was 25.5 hours. I knew that I had lost an hour to the heat of the day. It seemed like I should still be able to make 26.5 hours, but it would be so, so difficult. I went over the math in my head multiple times. To be done by 7:30am. That’s what I wanted. I told Kelly and I knew that he would hold me to it. I put the single earbud back in and we enjoyed some easy downhill cruising on a dirt road. I saw two runners at the bottom of the hill and I informed Kelly that we were “going fishing.” It was a man and a woman. We had no way to know pacer from runner, but I had it in my mind that I was just passing another dude on the course. Regardless, I had my time goal in mind and the course flattened to an odious gravel road. I needed to cover the next 4 miles in less than 50 minutes. I struggled to run even the slightest incline. Two miles to go according to my Garmin and I was frustrated that I couldn’t see any sign of a finish. I convinced myself that it was OK to reset my time goal, but Kelly wouldn’t relent. We hit paved road. I took heart that this meant the end was near, but I still couldn’t see it. We approached a spectator at the final intersection. He thought I was his daughter approaching. The third place woman. The woman runner behind us was not a pacer. She had been the third place woman. I unknowingly passed the third place woman at about mile 96. With this new knowledge, I ran the final half mile on pavement to the finish chute, completing the final 10k in 70 minutes. I recorded a 100-mile PR of 26:26:57. In those last two hours, I also accomplished a “Pain PR.” Finishing the Wasatch 100, on the whole, was the hardest thing I’ve ever done. 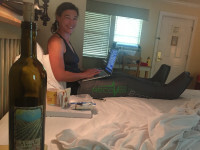 Recovery at its finest: my leggies, wine, chocolate. Receiving text updates about Betsy’s race. 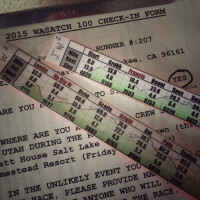 Wasatch 100 Plan: Have Fun. Be tough and just a little reckless. Great race Helen! It was a blast following you online all day and night through the tracking system. I hope the good vibes got through from San Francisco to the Wasatch! Most fun was watching your climb up through the pack as the day went on until you crushed it and took 3rd. Wow, great strategy and planning. Prob helped not having me chat your ear off for the first hour like at Bryce! Thanks again for the great time at Castle Peak 100k and congratulations on this great achievement. I was so happy to see you finish at Castle Peak! I wish we had gotten to visit then! You’ll need to come run with the DPMRs again soon. Thanks for your kind words of encouragement. I’m as entertained by your race report as I was following your progress for 26+ hours. You put the work in and weren’t afraid of the pain during the race. So happy for you. Holy Moly. Amazing feat Helen. AMAZING! I am in awe of your determination and fortitude. Congratulations Helen! Your courage and commitment continue to inspire. Thank you, thank you, thank you! Thanks for the kind words. Your RDL awaits! You are well-prepared and will do an amazing job! Can’t wait to hear about it. Love it, awesome write up!!! There was lots of fun tracking this weekend, huh?!? Too bad the dudes will never know the pain of childbirth… it is a great reference point. Ha! Felt like I was there! Great write-up, and great run. You killed it. Awesome! Thank you for sharing your ups, downs, exhilarations, and just plain fun on the trail. I am living vicariously through you! Ah, thanks! Looking forward to seeing you on the snow (yes, SNOW!) this winter. Helen, I enjoy meeting you and talking to you on the bus ride to the start. Congratulations on a great race. What a wonderful race report. It brings back painful but rewarding memories. Like you, Wasatch was the hardest thing I’ve ever done in my life. Got ‘er done in 34:06! Not bad for a Floridian! Maybe see you one day at Castle Peak 100k. Happy running! So nice to hear from you! Very impressed with your flatlander finish! 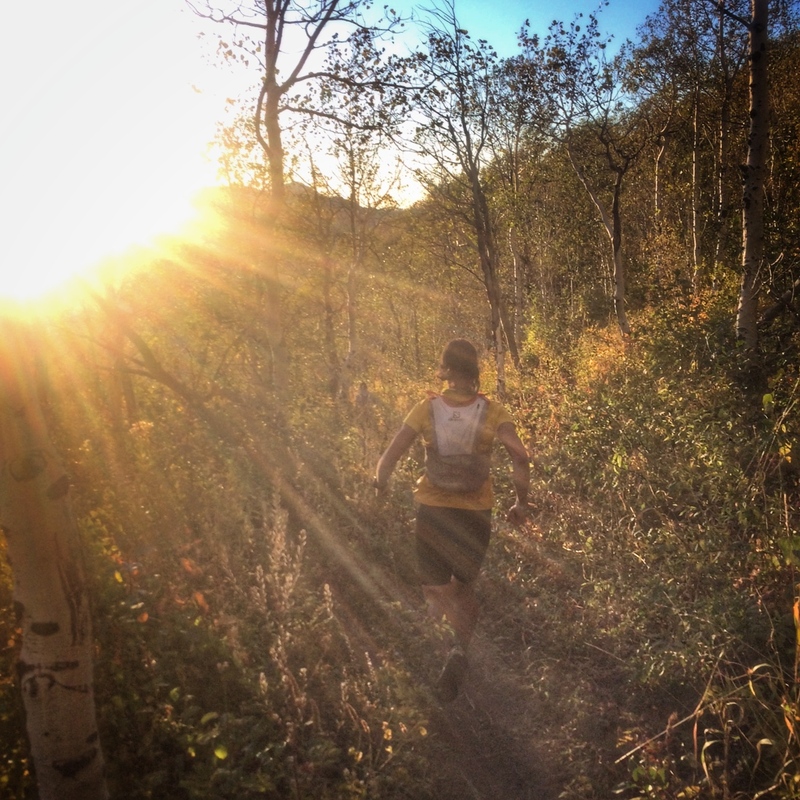 Would love to see you at Castle Peak 100k next year… tentative date is Saturday, August 27, 2016. Can’t promise that it will be as difficult as Wasatch, but it will be plenty challenging and is stunningly beautiful. I was wondering if you had any other articles or could share any insights into dealing with your asthma and the dust during the race. 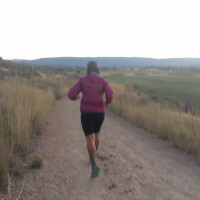 I’ve been in a journey of discovery with asthma since it has plagued me on 3 different races now, and I’m trying to get a handle on it before Wasatch this year. Specifically, what did you do to mitigate for the dust, and what was your strategy with your Albuterol?